The annual Rembrandt Awards are the national public film awards of The Netherlands, first given out in 1993. The nominations are selected by members of the Film Committee and Jury of the Rembrandt Awards Foundation. The winners are selected by the Dutch public through online voting. Special Awards recipients are awarded by the the Film Committee, RAWA members and Jury of the Rembrandt Awards Foundation and based on nationwide polls. The nationally and internationally televised award ceremony is held in Amsterdam near the famous Rembrandt square each March. Millions of viewers around the world around the world will watch parts of the ceremony and show within movie programs and news, both via tv, online and mobile. The name of the award and foundation comes from the famous Dutch painter Rembrandt Harmenszoon van Rijn (1606 – 1669). Rembrandt is considered one of the greatest painters in European art history and the most important in Dutch history. He is known as a master, particularly for his groundbreaking use of light and shadow. The Rembrandt Award statuettes are sculptures of the artist. 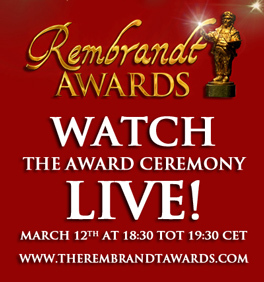 The 15th Rembrandt Awards ceremony will take place on the 12th of March 2012.